So I really like playing dominoes and I don’t mean standing them all up on end and knocking them all down. Playing dominoes is like playing card games: you’ve got a bunch of “bones” instead of “cards” and an infinite number of games that can be played with the cards bones. 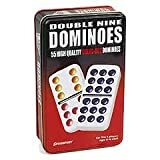 Dominoes come in different sizes: double sixes (this would make the highest domino have a 6 at both ends), double nines, double twelves and double fifteens, think of them as playing a game with multiple decks of cards. Using double nines is my favorite for about 2-4 people and double twelves for 4 or more; double fifteens just have too many dots on them to look at. Oh, and I like the dominoes with the dots with different colors; it helps in avoiding mistakes after too many hours of play. And of course with all games everyone has their variations; in Euchre you’ve got ‘Ace, no face’ and you get a re-deal (if they play that way) and if no one picks trump do you ‘screw the dealer’ (make them pick a suit) or re-deal? And many people play Monopoly with their own rules, such as: put utility payments on Free Parking and whomever lands on it, wins the the cash. Dominoes is no different everyone plays every game slightly different. One of the games I like is “Mexican Train” (which I’m sure has racist origins with it’s name), the nice thing about it is that it’s easy to teach, there is no math (except at the end of a round) and you’re really just (strategically) matching your dominoes from end to end. Here’s a good set of Mexican Train Dominoes instructions with some additional directions. It’s really too complicated to explain here which is why I provided a link to the instructions. 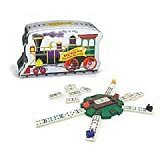 Many sets are sold as Mexican Train sets but they just include a “train station” for the starting block and little train pieces as markers, we just use the starting block as the train station and pennies for markers. About halfway through we realized we that we forgot the mexican train part! That plus the few other parts we goofed up made me think that maybe we made up a new game?!? “In this first turn only, the player may play as many dominoes as they wish, so long as they form a valid train”, I’ve never seen anyone play it that way, we’ve always taken turns putting one down at a time per turn. “If any player is unable to start their train – having no domino that matches the centre double – they do not draw from the boneyard”, don’t think we’ve ever done it that way either! Always make them draw one. We also play that you have to announce when you are down to your last domino, if you don’t by the time the next player picks up and someone calls you on it, you pick up another piece (I don’t know if I learned it that way or accidentally transferred the rule from a different domino game). There were some other differences too, but some seemed to be tied into the earlier differences. But as long as you all play by the same rules, I guess it really doesn’t matter. There is another domino game game we play that I like (and don’t know the name) where you don’t score unless you add up all the ends of the pieces of the board and it’s a multiple of five, this one is a lot more confusing. Previous Post: Where does all the snot come from?!? http://GarySaid.com/mexican-train-dominoes/ generated Friday, April 26th 2019 at 6:43:25 am EDT (in 83 queries in 0.637 seconds).